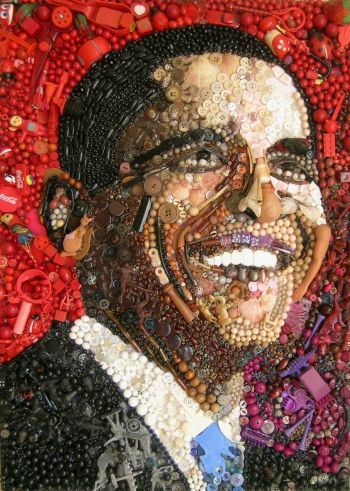 British artist Jane Perkins creates beautiful works of art using everyday objects like marbles, toys or buttons picked up from recycling centers, second-hand shops and junkyards. Jane Perkins worked as a nurse for 17 years, in a London hospital, before she decided to explore her artistic talents and got a degree in textiles in 2006. 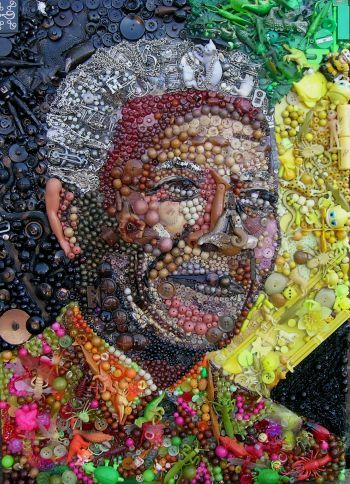 For her graduation thesis the artist chose a topic that would later be associated with her name - “Recycled Materials in Art and Design”. 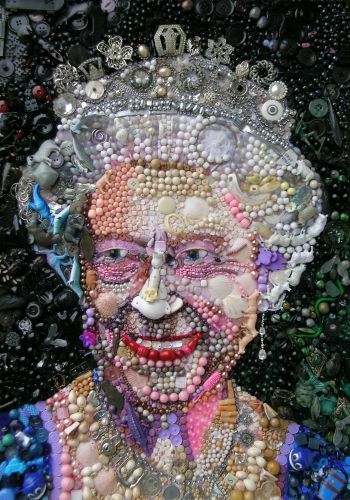 She began her successful career by creating stylish brooches mad with discarded jewelry, coins, sea shells and other found junk, but soon moved on to other more complex and impressive works. Taking inspiration from Ecuadorian artists who take broken pieces of jewelry and implement them in original hair designs, and from the found objects themselves, Perkins creates colorful masterpieces exhibited all around the world. She loves to make art with an element of fun and unexpected and says she will use anything colorful that she can get her hands on. 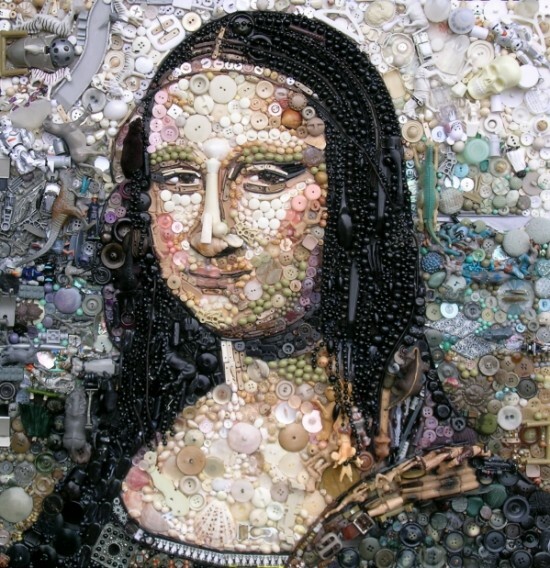 Luckily, Jane doesn’t have to scour second-hand shops and recycling centers as much as she used to, as people in her neighborhood learned about her art and began leaving bags of unwanted stuff on her doorstep. 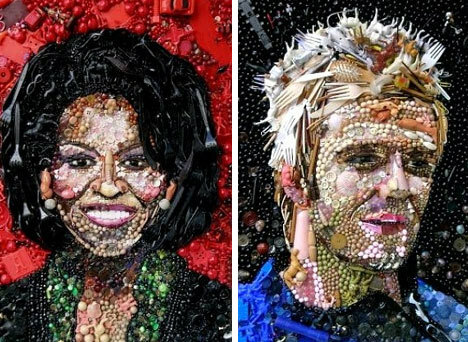 For her detailed portraits of celebrities, Jane Perkins starts out with a photo of the person she wants to depict and proceeds to attach colorful objects over it. She uses cut up plant pot markers for the teeth, and plastic forks to give the hair a textured, spiky look. The only item she buys for her works are eye beads, which apparently allow her to capture emotion in the picture. 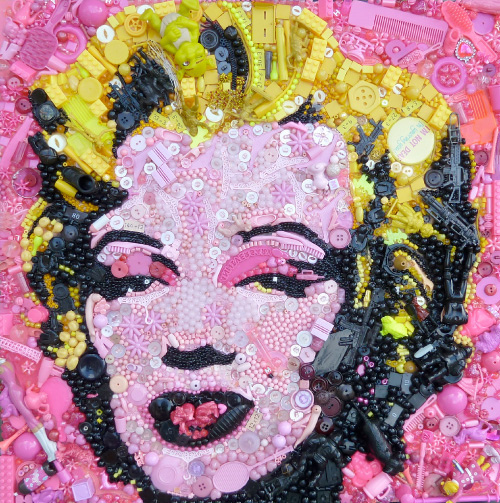 Jane’s original style has caused quite a stir in the art world, and collectors pay up to $3,250 for one of her pieces.